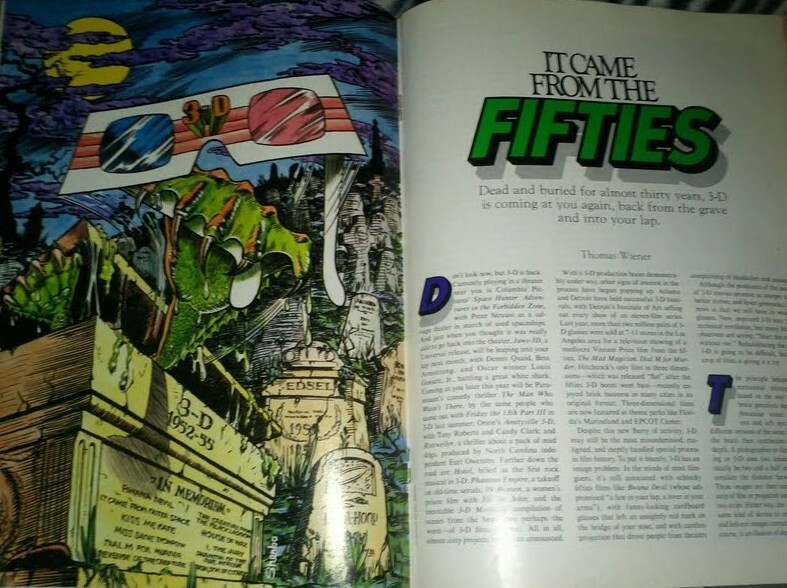 Le fan pur et dur de Jaws 3D sait que s’il souhaite dénicher des informations supplémentaires sur son film préféré, il va devoir s’armer de patience et fouiller inlassablement dans les pages jaunies des nombreuses publications parues entre l’ été 1982 et l’ hiver 1983. Malheureusement, le résultat de ces recherches est, comme on peut s’en douter, souvent décevant… A ce tarif, deux lignes sur le film de notre ami Joe Alves et c’est direct la une de votre site préféré!!! Bien que consacré principalement à l’ épisode VI de Richard Mar… heu… Lucas, ce numéro de juin de l’ American film s’autorise un dossier 5 pages sur le retour de la troisième dimensions dans les salles obscures! 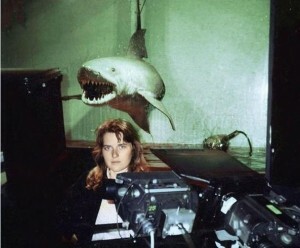 Bien évidemment, le cas de Jaws 3D est largement abordé! L’ occasion de lire quelques déclarations des principaux responsables de ce troisième volet! Afin de vous faire économiser quelques précieux dollars, je vais me faire un joie de recopier les quelques lignes en relation avec notre sujet de prédilection… Ne me remerciez pas, je suis particulièrement généreux en ce moment! Partager la publication "American Film (USA) Juin 1983"
Dernier volet (faute d’informations) sur la version explosive de notre star aquatique. 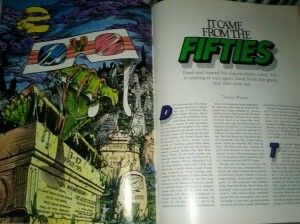 Tirées des archives personnelles de Danielle Versé et des pages du magazine Cinefantastique, ces deux photographies ne pourront que vous convaincre de la qualité du travail effectué par la petite firme PSE. La premiere nous montre la toute jeune (28 ans!) Danielle Versé posant fièrement devant sa dernière création sous le(s) regard(s) d’une twin-camera 3D de Mitchell. Le monstre est, comme vous pouvez l’imaginer, placé dans un bassin équipé d’une épaisse vitre censé résister à la fois à la pression de l’eau et à celle provoquée par l’explosion. Sa taille permet aussi de multiplier les points de vues. Ainsi, deux angles (de face et de côté) seront mis en boite pour le besoin de la scène. Partager la publication "The Exploding Shark! (2/2)"
Partager la publication "Jaws 3D O.S.T LP + Autographs"
Dernière partie de notre dossier consacré à l’artiste Mike Schultz au sujet de sa collection 2012 qui contiendra, comme vous le savez, une version NTT de notre Bruce III préféré! Bien évidemment, www.jaws-3D.com suivra de très près la conception et la réalisation du monstre tout au long de ces prochains mois. En dehors d’ un potentiel Blu-ray, le Bruce III NTT est à coup sûr l’ évènement de 2012! Quoi qu’il en soit, je viens de récupérer de nombreux articles assez rares qui devraient nous aider à patienter jusque là… Restez nombreux à soutenir ce site! In your opinion what really differentiates Bruce 3D from Bruce and Brucette? **This is a VERY rich area for discussion! In my opinion the Brucette from Jaws 2 is VERY close to how the full-scale Bruce 3D shark appeared on film in many ways. I am not saying they are the same, I am saying that they are far more alike than they are different! Much of this goes back to how a skin is framed and padded out. I know from all the mechanical dinosaurs and the 7 different mechanical sharks I have make in the last 30 years. You can take the exact same skin and stretch it on a different frame, or pad it different and you will have both looking as unique and individual from each other as the Tow Sled Shark was from the Platform Sharks from the first movie! In fact, the head that is blown up at the end of the first movie was from the same molds but not stretched out at all, but rather just hung on a lose framework; it looks nothing like any of the Bruces’ that any of us would recognize. Many people get into trouble when they attempt to model a Bruce by using Junkyard Bruce materials. The same for the Bruce 3D and the Brucette from the 2nd movies. They have very intense similarities. I can tell screen-grabs and behind the scenes material apart at a glance due to memory. But recently new photos appeared of the Brucette without teeth, and the coloring and off-angle pose made them look almost a dead-ringer for the Bruce 3D for me. The differences are that subtle when key features like the lower lip and scars are hidden from view! Of course we can all tell from the big things like the burn-scars, or the overly jutted lower jaw. The teeth and inner-mouth are a dead give-away as well. But it is that triangle of eye to snout to nostril that is nearly identical, and measures nearly the same as well for the 2nd and third sequel Bruce’s. In my conversations with Mr. Alves he has greatly detailed for me how they made changes to the Bruce mold to achieve what they did with Brucette for the second film. The upper skull area is the same. Everything both below the cheek-bone area and behind are different, including of course the neck and gills. So, in a few scenes here and there you can see the original beloved Bruce in Brucette very clearly. Interestingly enough, in the first movie you can also see some of Brucette in Bruce! When Bruce’s mouth is nearly closed and the upper skull is lowered and the jowls are hidden then it is clearly exactly like Brucette for that upper head area. 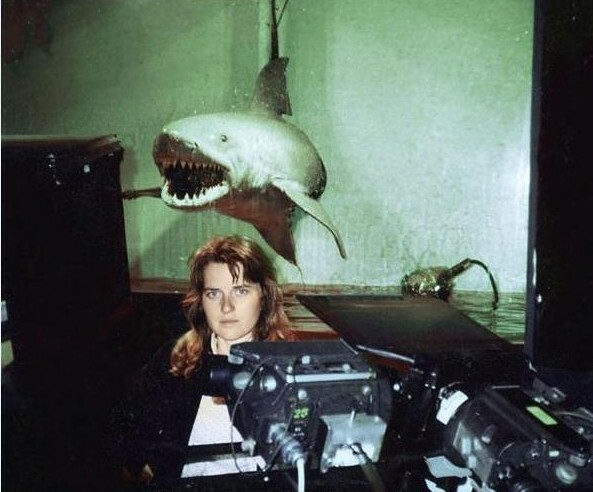 It’s in how they made the shark’s carry themselves on-screen as well though. Bruce nearly always had his mouth wide open and his upper skull raised high and agape. 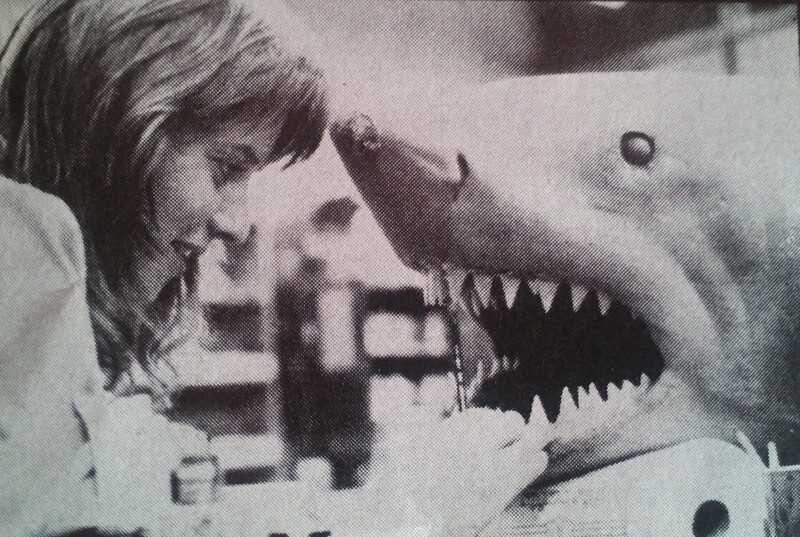 Brucette nearly always had its mouth nearly closed and upper-skull lowered like a cruising White shark. 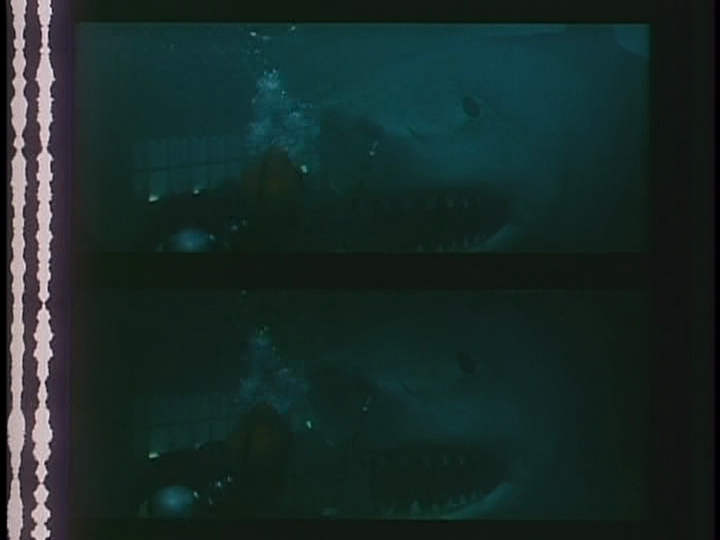 Similarly the Jaws 3 Bruce was most like the Brucette in its standard pose, with the upper-skull lowered. This gave it the same look of it’s eye being higher in plane than the snout-tip. 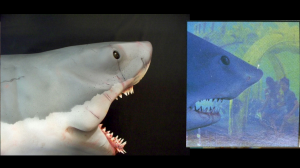 Both of these sharks also featured extremely weak looking jowl-muscle areas. 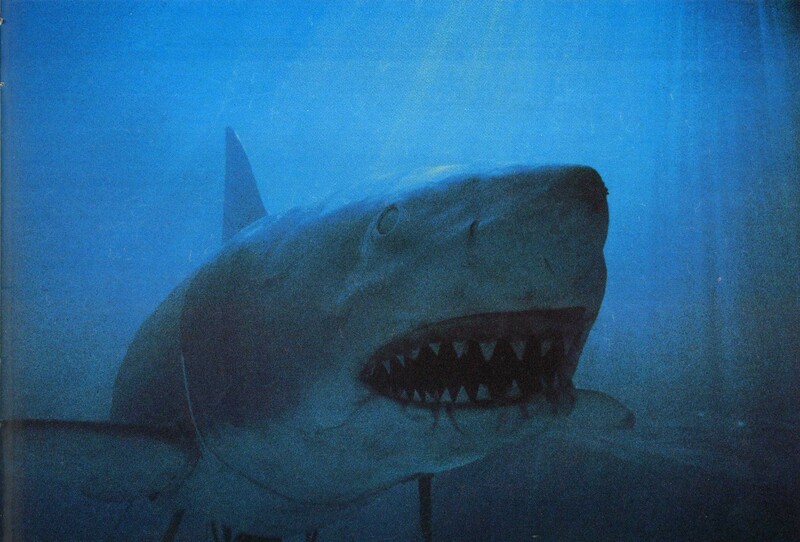 In trying to back away from the tiger-shark or catfish style jowls of the first Bruce I believe that they became unbalanced and went overboard in losing that look and made their sharks look VERY weak-jawed. Both of these sequel sharks featured similar pinched-style hinging at the cheek corners to help defer the bulging and bowing as the mouth’s flexed. I too fought these same problems as a teen making my first set of mechanical sharks. If you don’t design this area right then the entire head balloons or draws thin as the mouth operates, no matter how you frame and pad the skins out. Of course the mouths and teeth and gills are entirely different as well. The first Bruce was truly the slimmest of all the sharks. Brucette used the same frame as the original, but that frame was heavily modified and larger. This is also made reference to in the Jaws 2 Log. After Bruce, the following sharks became much fatter and roomier on the inside. The throats also began to become less deep as additional room was taken up with ballast or floatation aiding gear. 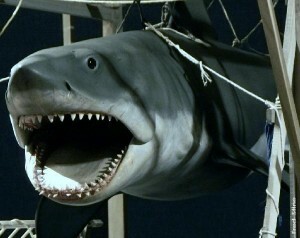 Now if you want to talk bodies I am currently still crunching numbers on the Bruce 3D shark. But so far I can tell for certain that the Bruce and Brucette used the same body molds. But in order to maintain screen-used accuracy for my Brucette I will have to alter the fatness of the body and trim the dorsal and tail fins differently. so I will have to make an entirely new body mold for our Brucette as well. So far the Bruce 3D body seems to be the same as the Brucette body but it was framed and padded differently as well. So I will also have to make an entirely new body for the Bruce 3D as well in order to make it accurate. 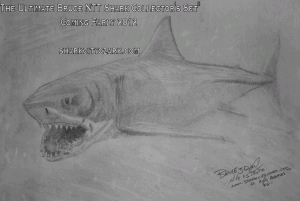 Once discerning fas have their entire Bruce NTT Shark Collector’s Set in front of them on the shelf then they will see and understand and appreciate all these nuances and unique features themselves. And I honestly do believe that we will continue to receive ‘Thank you’ letters for many years to come for doing our due-diligence[s] in honoring exactly what these sharks really were both for the camera, and behind the scenes; instead of just trying to let talent and guesswork roll the dice like most other artists have done all these years. 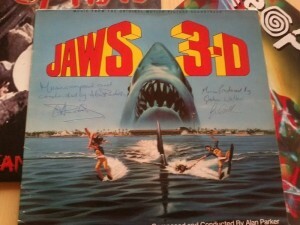 Romain, I sure do thank you for your time, and for asking me to be a part of your efforts at Jaws 3D. If you want I would love to keep you and your readers in the loop about us at SCO and our efforts. I may not have the armchair-general knowledge memorized verbatim like so many seem to rattle off on forums so often. But I do have over 30 years of making these sharks in various forms, as well as the Dinosaurs to be able to place a practical and experienced base edge to my writings. I am open to whatever you or your readers may want us to provide. Please keep us and www.sharkcityozark.com in mind. Our chief goal is to get our Sharks professionally mass produced by one of the great companies out there like Toynami or Hot Toys. We simply cannot survive forever trying to put a Shark on every shelf all by ourselves. There is plenty any friend of SCO can do to help out. Feel free to send photos of our SCO sharks and an email to ANY toy or collectibles manufacturer and ask them to pick us up and produce some one or all of our sharks! * Make and keep your favorite site current with our products, photos or art-work. then the more open they will be to utilize us and or our materials. Besides, If our Sharks get mass produced by the right people than they will be FAR More Affordable for everyone! Partager la publication "Mike Schultz nous parle de ses projets (4/4)"
Depuis quelques années, je possède cette petite bobine Super 8 (le meilleur format au monde, rappelons-le) de la bande annonce anglaise du troisième volet de la saga Jaws. J’avais prévu de vous en faire profiter mais, pour d’obscures raisons de copyright, aucun laboratoire français n’avait accepté de me réaliser de transfert Super 8/ DVD+R … Résigné, j’en suis même arrivé à immortaliser ces deux minutes sous la forme d’un screener satisfaisant en terme de qualité d’image mais désespérément muet (la faute à un projecteur qui ne gère malheureusement pas l’audio)… Dieu merci, un internaute a mis en ligne aujourd’hui cette bande annonce sur l’incontournable Youtube, m’épargnant de nombreux soucis! Comme vous pouvez le remarquer, cette bande annonce destinée au marché anglais (où la version plate était privilégiée par les exploitants) est identique à celle de Der Weisse Hai 3 in 3D uploadé par mes soins (en dehors de la langue bien évidemment, du carton titre et du plan inversé déjà mentionné auparavant). Il y a fort à parier que ce trailer ait été décliné pour le reste des pays européens. C’est en tout cas, ce que j’essaierai de prouver prochainement. 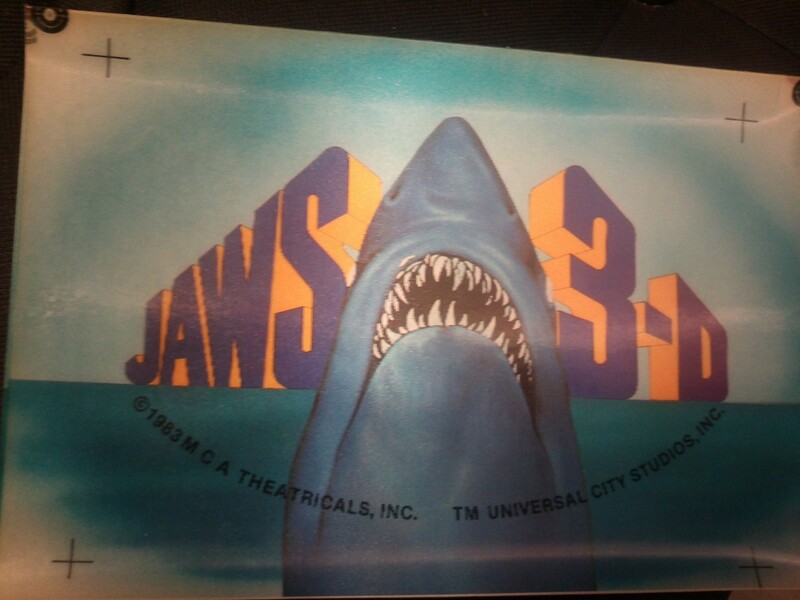 Partager la publication "Jaws 3 « Trailer UK » 1983 (+ super 8)"
Bonne surprise que cette carte lenticulaire labellisée Universal Studio qui permet en l’inclinant légèrement de voir la star de Jaws 3D successivement ouvrir et fermer ses énormes mâchoires pendant que ses petits yeux d’origine noirs deviennent subitement blancs comme l’avait expliqué Quint dans son long monologue à propos de l’ USS Indianapolis… Le logo par la même occasion alterne entre le rouge/jaune de l’affiche et un bleu/jaune du plus bel effet! Les dimensions de la carte sont plutôt impressionnantes: 8″1/4 sur 5″1/2… Prévoyez donc un gros portefeuille si vous souhaitez l’avoir en permanence sur vous! 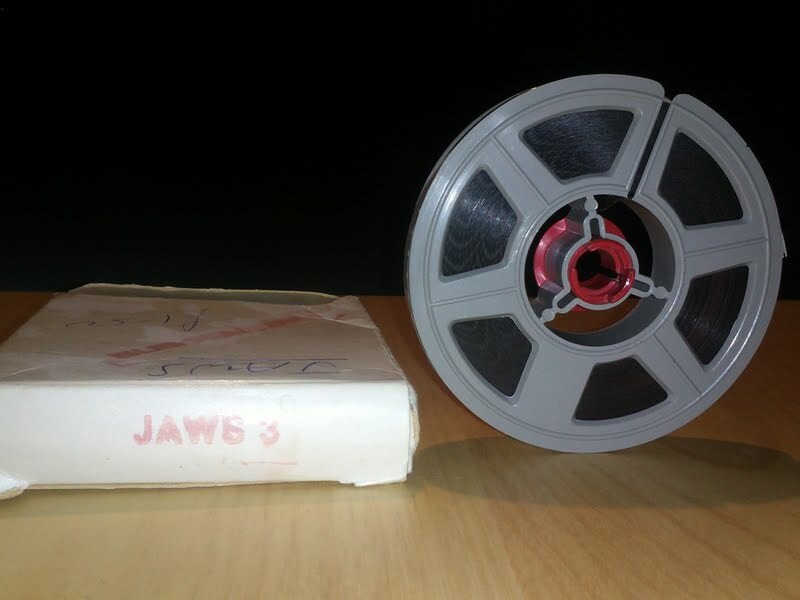 J’en profite pour vous annoncer que je travaille sur un wiki special Jaws 3D intégralement en français qui devrait se limiter aux évènements et personnages du film et des différentes versions du scénario… On en reparlera plus tard! 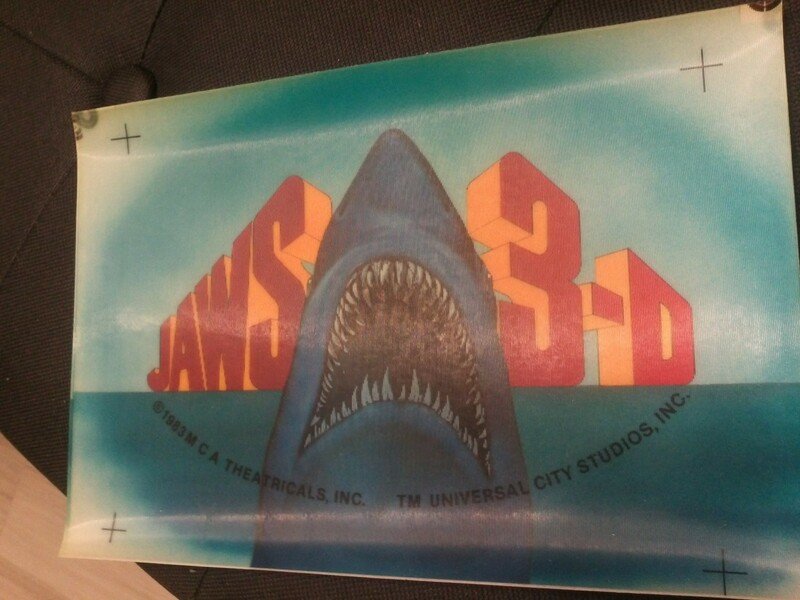 Partager la publication "Carte lenticulaire Jaws 3D (USA/1983)"
N’ayant définitivement pas le temps de rédiger de nouveaux articles à propos de votre film préféré, je vous invite à continuer notre longue entrevue avec notre ami Mike Schultz. Une entrevue passionnante qui devrait vous faire patienter pendant quelques jours… Sachez que la majeure partie de mon temps est consacrée à la sortie de mon quatrième album: Faux Mouvement (dont vous pouvez écouter quelques extraits sur le site de Néophyte). 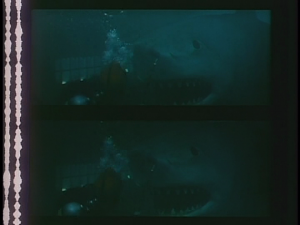 There are many different shark in Jaws 3D. Are you planning a synthesis of all these models, or you focus on one? No, we are limiting our All New Full Length Bruce 3D NTT Shark to the actual full sized underwater filming model from the studio Tank. As you and your readers know, all the 3D sharks were pretty much night and day in difference from each other. 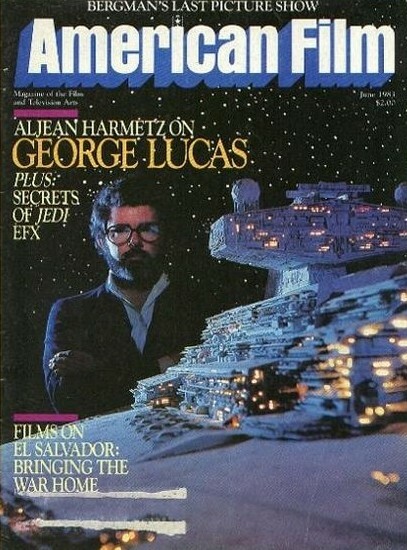 The miniatures looked nothing like the full sized models. To try and blend them into just one model would seriously diminish what the 3D Bruce really was. I believe this was Mr. Nicotero’s expressed reasoning for the large Bruce Shark head that he built, and the mods that he performed on the NTT that I sold him. He stated to me that he felt that Bruce was Bruce and that he did not really care for the differences between the filming models to be pointed out. However; his expressed preference was clearly for the Tow Sled Shark. 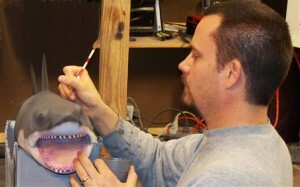 The majority of the reference materials apparent in photos of them building it [the 1:1 head] feature mostly Sled-Shark materials. There is nothing wrong with either approach. But we are making scale model replicas at SCO. And any scale model builder can tell you that they want a scale model to be accurate, not just something based on an artists feelings or limited by his/her skill or abilities. They want an F-16 Falcon based on real world measurements and study, not something artistically based like the G.I. Joe Toy F-16 down at ToysRus. Those that have studied the shark’s from the first movie know that the sled shark uses a skin from the same generic Bruce molds, but stretched over an entirely different frame. Its eye cut-outs were very different, its jaw hung slack and it was framed very much fatter, especially around the neck area. 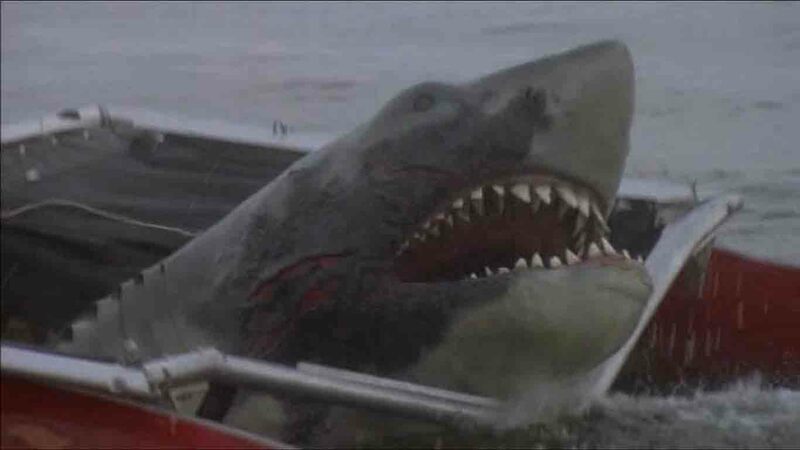 So Mr. Nicotero chose to make the shark’s more like a Sled Shark, but also appeared to have mixed in the ‘feel’ of the Platform Bruce’s as well in some areas. As you can tell by looking at his sharks, they indeed are very Bruce-Like. He does FANTASTIC work! But they are not like any one particular Bruce or scene from the movie. They are good, VERY good. Just not any one Bruce as recorded by history is, is all. We don’t want to lose what we all grew up with, in an attempt to somehow conglomerate the Bruce 3D experience into one pseudo-shark. That is not recording history, this is not mathematically-accurate reproduction for future generations and the current generation of collectors. We may be wrong about this, after all its only our opinion and how we approach things. But we want to be remembered for being the first people who provided what we said that we would provide the community. And that is, a mathematically accurate scale model of Bruce. 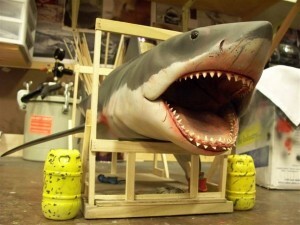 Specifically our original NTT Shark is as perfect a scale model of the Right-Sided Platform Bruce Shark from the movie’s 3rd act as has ever been made in 30 years. This is what we are delivering on for the Jaws 3D fans as well. 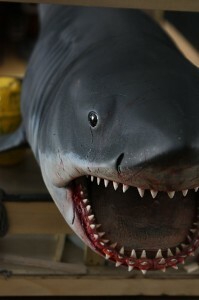 Our All New Bruce 3D NTT Shark coming out 3rd Quarter of 2012 is going to also be the only mathematically perfect scale model ever made of the full-Scale underwater filming model of that Bruce 3. Now we are also going to model the Baby Bruce in scale, but that will only be available to those that purchase the entire set of 4 sharks. We love to include bonuses like this for those that are as over-the-top as we are. As if we needed to add any bonus material though. Literally nothing of any accurate styled value has ever been offered by anyone for the 30 years of this incredible Shark franchise. We have come along and not only finally delivered something worth collecting, but far more worth even double what people have paid for them. I base this on what my original NTT sharks are re-selling for currently, and this is double what I made them for and sold them for last year alone! Now that says something dramatic about the quality of my familie’s vision and work in this field and community! Partager la publication "Mike Schultz nous parle de ses projets (3/4)"
Bon nombre de sceptiques me font part de leurs doutes concernant la possibilité de voir apparaitre prochainement sur le marché une reproduction fidèle du requin des Dents de la mer 3. Effectivement, le matériel promotionnel concernant la star du film est assez maigre et ces interrogations sont parfaitement légitimes. Il me semble donc judicieux de poser directement la question à notre ami Mike Schultz qui ne manquera pas de nous rassurer. There are very few promotional material and informations about the Jaws 3D shark. From what document you’re working on this model? « Our version of the Bruce 3D shark is based solely on the full scale underwater filming model as depicted in the sketch that I provided you for this article We are pleased to announce our alliance with you and your site. If it were not for your help and direct feedback , as well as critique and supply of photo reference materials than I would most likely fail in replicating this shark faithfully. Thankfully you have supplied me with some incredible material, enough to measure and scale up to match the scale of our other Ultimate Bruce Shark Collector’s Set. Your provided reference materials and the photoshop enhanced screen-grabs from the movie have provided everything that we have needed and then some. Bruce 3D will be both Dynamic and Incredible! From your provided material I have been sketching the Bruce 3D both on paper and in clay. My latest 2 models are already much more accurate than the old dusty head on my shelf from 2010. We are confident that the All New Full Length Bruce 3D NTT Model will be absolutely screen accurate in every way. We have even found a few nice surprise details to include. That’s one of our favorite things to do is to include little known details into our models to educate fans with. Discovery is a fun thing! You see, our background is in producing Museum Displays. Oftentimes full scale ones at that. The purpose of our models is two-fold; to record history and also to educate. We know that most people buy them just because they are pretty cool and perfectly accurate. But that doesn’t mean that they can’t have neat things to discover and learn about for years to come too.. We tend to think of our Shark Displays as well rounded experiences for our friends and fans. 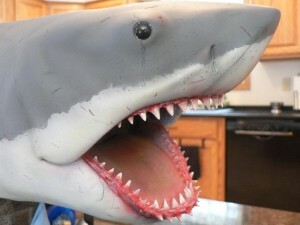 They are not just any Shark models, they are the best of the best so far. N’ hésitez pas à me contacter si vous souhaitez en savoir plus sur tel ou tel aspect de la réalisation du très attendu Jaws 3D NTT. Partager la publication "Mike Schultz nous parle de ses projets (2/4)"